As the world watches refugees return to what may be left of their homes in the former Yugoslavia, Oana-Maria Cajal’s The Enduring legend of Marinka Pinka and Tommy Atomic couldn’t be more timely or more disturbing. Set in a refugee camp somewhere in Europe, an mélange of characters are hole up, awaiting their passage out of this limbo place to a life they hope will be better than what they’ve left behind. In an absurdist style that plays fast and loose with non sequiturs, overlapping dialogue and languages, and a pointed pointlessness, Cajal depicts lives filled with hope and despair, dreams and realities that grate on each other and, above all, the resilience of the human spirit – even in the face of the greatest of adds. As she did with the stunning BLOODLINE: The Oedipus/Antigone Story, director Joanna Settle takes a erratic and epic story and gives it clarity and purpose. Filled with glowing performances among the vast ensemble – striking of which are Anne DeAcetis’ androgynous teen who mesmerizes his campmates with a chess set made from bread. You enter the theatre through clear plastic sheeting marked with the insignia of the Red Cross. Papers stamped to look like official documents are scattered everywhere. Restless people wander about, and some, wrapped in bright orange emergency blankets, are curled up on ragged mattresses. But director Joanna Settle, who earlier this season staged the superb production BLOODLINE: The Oedipus/Antigone Story, has devised such an intriguing rhythm for the 90-minute play, and so deftly used stylized movement, music and the design talents of Sahin Sahinoglue (sets), Meanlie Baumgartner (costumes) and Jack Magaw (lighting), that you are drawn into the artifice of it all. Hovering over the play like some kind of malevolent trickster is Herr Faust (the charismatic Mark Ulrich), crossing destinies in the camp are Eva (Julie Hurt), a woman who clings to the phone number of a guy in Los Angeles; her daughter Little Eva (Eve Alexander, a sixth-grader and star actress in the making) and Misha (the man who hopes he can be Eva’s second choice when the rescue fantasy fails). There is the idealistic Yuli (the very interesting Anne DeAcetis) who carves chess pieces from stale bread. And there are many others, so memorable you find yourself wondering how their lives will turn out. Under Joanna Settle’s fiercely intelligent direction, this motley cast explores the erratic dimensions of a psychological terrain damaged by insidious prejudice. 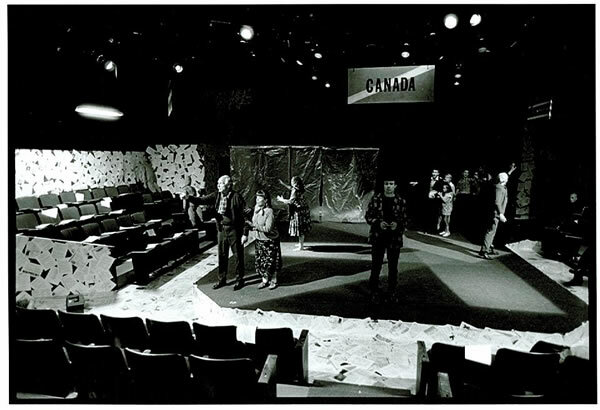 Audiences enter the theatre through plastic curtains emblazoned with Red Cross insignia. Faceless, lifesize cloth puppets on a string are placed in some of the seats. When the characters face their immigration interrogation, these vague, monstrous figures bolt upright with an air of callous monotony. The plastic curtains semi-concealing the men’s quarters create a blurred portrait — further emphasizing the nameless faces from faraway lands wailing and yearning across our TV screens. The invigorating Anne DeAcetis turns in a rambunctious, yet unobtrusively mournful, performance as Yuli, a boy who fashions a chess set out of stale bread. Director Joanna Settle has created a striking mood of clashing cultures underscored by a cable of human commonalty that, while deeply buried, is impossible to disregard.